A clash of young and old, of ancient magic and burgeoning wisdom; a tumultuous struggle fo survival; a search for love, truth and a place in the world; a coming of age; a leave taking, and an arrival. It has begun . . .
Gavin has given up on the adults in his life, and they’ve given up on him. His father appears to hate him, his mother is scared of him, his teachers think maybe he should be in a different school. What he has is a gift – one he neither wants or understands. At fifteen, his closest friend and confidante is the mysterious Miss Grey, although he has also given up trying to talk to people about her as it only seems to upset them. Turned out of school, and not included in his parents’ holiday plans, he catches a train to what might be his last haven; is aunt Gwen in Cornwall. However, she is not there to meet him. Instead the weather is turning bad, and unnerving things are stirring. Cast into a world of strangers, Gavin finds people less unlike him than anyone he’s met before . . . that is until he encounters some who aren’t people at all. And, for the most part it is, but for me there was just a little too much of it. Racking up just over 400 pages for this first part of a trilogy just felt overwritten to me at times, it has a great premise and great opening with Gavin heading to Cornwall on the train and the strange encounters he has just on the journey alone, and a great action and horror filled end section which sets the stage for book 2 nicely, it just felt too baggy in the middle to me. I’m sure that it’s a problem with my tastes rather than the book itself, however, as it’s getting great reviews on the whole and I’m sure that fantasy/magic book fans will lap this up and, in fantasy fiction, you can’t go wrong with a trilogy of huge books which feature wizardry and rings, right? 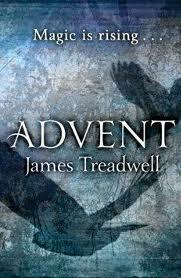 I enjoyed Advent, but wasn’t so fond of the last chapter (after what I would say was the ending of one book and the beginning of the next… if you get what I mean). Just goes to show….I actually really liked the end section (which certainly feels like the start to the second volume, I’d agree). Clearly on this one, it just wasn’t quite what I wanted/thought it might be – but I’m sure many love it – but that’s what makes book discussion so good, right? Thanks for dropping by and leaving a comment, Nikki-ann.